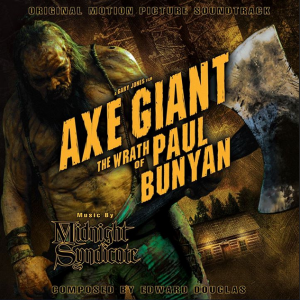 “Axe Giant Main Title” starts off with a opening fanfare reminiscent of King Kong. This is the first of many times Max Steiner’s influence is felt in the album. The pounding provides a sense of something large and dangerous while the lighter notes and wordless female vocals add to its sense of mystery. The folksy and calm “Minnesota 1894” is filled with soft ‘n pretty banjo pickins’ and the use of drums and flutes in “Babe’s Grave” is almost “Asian” in feel (albeit with some menacing undertones at the end). “S.T.U.M.P. Medley: The Adventure Begins/Meeks’ Theme/Sgt. Hoke’s Theme” is divided into three distinct parts, the first of which uses drums to create a feel of laid back adventure. This feel gradually builds up and is joined by horns. The next segment has some banjo strummin’, but is more serious than the last track to feature the instrument. Finally, militaristic drums and a reprise of the adventure music close things out. “Bunyan at Babe’s Grave” conveys sadness with touches of the main theme to show the danger of a mourning monster. The low, slow buildup of “S.T.U.M.P.s Meet Bunyan” leads to another awesome Kong homage. The mix of contrasting heavy and light notes helps the listener imagine humans fleeing from the massive killer. Bunyan’s footsteps are conveyed musically once again in “No Escape,” where percussion and strings create a low key sense of dread as well. “The Legend of Paul Bunyan” really makes you appreciate the range of the banjo. It can be happy, like it was in the second track, but can be downbeat and moody like it is here. This track is also the longest one on the album and is also a musical roller coaster of shifting moods. Sometimes Bunyan’s musical footsteps appear to give chase, sometimes they combine with the banjo work and sometimes strings and tolling bells appear to add more dread. “Zack’s Last Stand” also has the feel of someone on the run due to its fast paced and frantic music while “Bunyan’s Cave” revisits lots of elements from previous tracks to create a suspenseful and uncertain feel. The fast-paced tone of “Bunyan on the Move” will easily make someone think of a chase and the fearful violin buildup and occasional tolling bells of “Final Showdown” create a feeling of death. The militaristic drums are a nice touch as well. “Legend’s End” is appropriately majestic and mournful while “The Ballad of Paul Bunyan” is a catchy acoustic guitar track summarizing film’s plot. Since I can’t go into detail in order to avoid potential spoilers, let’s concentrate on how this is a great track from Hick’ry Hawkins. He’s a wonderful vocalist and the track reminds me of something from an old Rankin-Bass television special at times. “Meeks at the Cabin” is quite spooky despite its short length and makes for a nice close to the album. It’s just as weird for me to write a review a Midnight Syndicate album without it being under the “Music to Haunt By” banner as it is for you to read it. But I felt it was the only way to do the album justice. Since most of the album is a mix of spooky and not spooky material, I would be left with a bunch of tracks that are unsuitable for a haunted attraction. I could see “Minnesota 1894” working in a weird west setting (especially if it’s used in a room based around the area before it became haunted), but that’s about it. And since the spooky tracks are all based around Paul Bunyan, all my suggestions would involve rooms involving chases and rooms with a huge monster inside. That just would not make for a good article and I thought it would be better to approach this strictly from a music review standpoint. And you know what? I’m completely fine with it! There’s so much wonderful music to be heard that any potential use in haunted attractions doesn’t matter. Just sit sit back and enjoy the mix of relaxing and exciting music. Several tracks have already entered my year-round playlist and I’m sure you will make a similar decision. I asked Edward Douglas for his thoughts about the album and he was kind enough to let me post the following quote: “The ‘Axe Giant Soundtrack represents some of my favorite scoring work I’ve done to date. It was equally challenging and rewarding and gave me the opportunity to spread my wings a bit as a composer.” After listening to the album, I’m sure you will agree with him. The score is also part of the reason he was inducted into Cleveland’s Independent Filmmakers’ Hall of Fame. If all that doesn’t convince you to pick it up, I don’t know what will!